There are two terms associated with computing that are frequently used but which often cause confusion. One of the terms is bittorrent and the other is bitcoin mining. I am going to admit that I have read all there is to read about bitcoin mining and yet I am still confused. Bittorrents on the other hand are fairly easy to understand when somebody explains it to you in simple terms. In this guide I am going to explain what torrents are, the legality of using bittorrent clients and the places where you can find torrents. I am also going to give a brief overview of the KTorrent client. BitTorrent is a protocol supporting the practice of peer-to-peer file sharing that is used to distribute large amounts of data over the Internet. account for approximately 43% to 70% of all Internet traffic (depending on geographical location) as of February 2009. In November 2004, BitTorrent was responsible for 35% of all Internet traffic. The above was taken straight from the bittorrrent wikipedia page. I am going to try and explain it in very simple terms. Before the internet came about, if we wanted something we would often refer to the yellow pages which is a directory of shops and services. For example, if I wanted a printed copy of “Fly Fishing by J R Hartley” I would get the Yellow Pages and find all the local book shops. I would then phone around the book shops until I found a shop that had a copy of the book. A bittorrent in its simplest terms gives you a list of all the sources that have the file you want to download. It is like a phone book for files. A bittorrent is better than that though. If I phoned a book shop asking for a book then I would have to wait for them to send the book to me. Imagine they have to order it in, it could take a while. Bittorrents work by telling the bittorrent client which sources have the file you are looking for. The client can then set about getting the file downloaded not from just one of the sources but by all of them. Basically what that means is that if I wanted “Fly Fishing From J R Hartley” then every book shop would be photocopying the pages they had available and start sending them to me all at once. I would have a complete book quicker than if I waited for the one shop to send it to me. This wiki page gives a guide to the terminology used by bittorrenters. Are the use of bittorrent clients legal? Wikipedia has a good page discussing the legalities of the use of bittorrents. The use of peer to peer software and the use of bittorrent clients is not illegal any more than using Google as a search engine is. If I search Google and look for things that are within the boundaries of the laws of the country I live in then I am not doing anything wrong. Similarly if I choose to download a file using a bittorrent client and that file is not covered by any form of copyright then it is perfectly legal to download that file. The bit that is illegal is the use of bittorrent clients to download full feature length films without paying for them or for downloading games, music and software that have copyright protection. Whether you choose to use a bittorrent client for this purpose or not is for you to decide. The copyright holders and the movie companies are coming down harder and harder in the UK, including the increased use of solicitors sending out threatening letters etc. Personally I don’t bother downloading films and legality is only one of the reasons. My internet connection is so poor that by the time an entire movie was downloaded it would be shown as a repeat on UK Gold television. Is it safe to use bittorrent clients? As with most things in life if you stay in the mainstream then you are less likely to be nabbed by a crocodile. If you move off the beaten track then you might catch something nasty. If you are using a Windows computer make sure that you have decent antivirus software and before opening a downloaded file scan it. If you are using Linux you are in theory a little bit safer but remember than when you distribute that file to your friends, who may be using Windows, that if that file contains a virus then you will be partly responsible for spreading malware. Generally I limit my use of bittorrent clients to downloading Linux distributions. About.com has a list of the 30 best torrent sites. Techsupportalert.com has a list of legal and free torrent sites. I have highlighted KTorrent as part of the series of articles I have written about applications that come as part of the KDE desktop environment. Previously I have written articles about Kopete, Konversation, Choqok, KMail, Konqueror, KDE Games and the KDE graphics applications. The actual KTorrent client is very simple to use and understand. The main window is used to show you information about the files being downloaded. 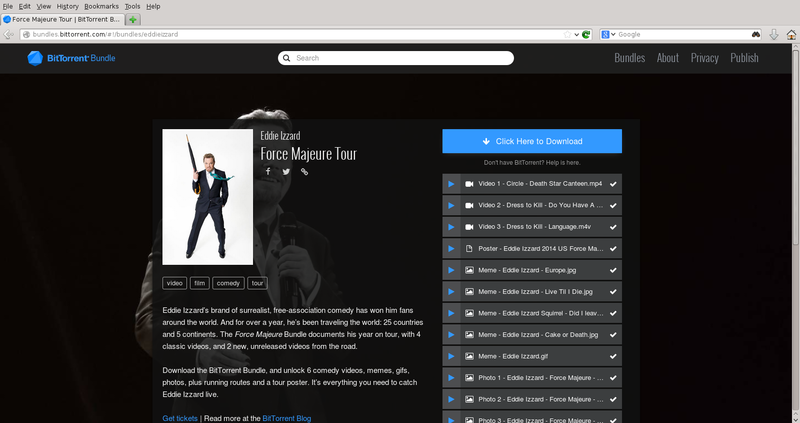 You will notice there are tabs showing all torrents, downloads and uploads. First of all I needed to find something to download and so I popped along to http://bundles.bittorrent.com which supposedly has free content and I downloaded the bittorrent for a file which contains various videos and pictures. I then clicked on the “open” icon on the KTorrent toolbar and located the downloaded torrent file. Remember the torrent file only contains the list of seeders which are the computers serving that particular file. A dialog window now appears showing the contents of the file to be downloaded and asks you to specify where the file should be downloaded to. At this point I can choose to download the entire contents or just the bits I require. The file should now start downloading and you can see a number of important factors such as how much of the file has downloaded, how big the file is in total, the speed of the download, how long it will take to download the file, how many seeders there are, how many leechers there are, and how far through the process you are as a percentage. The number of seeders is quite important as it tells you how many people are basically serving that file. Remember that as well as downloading files yourself you will be responsible for providing files to upload. This is another reason why I don’t use torrent software all that often. I have a download limit due to the fact I am forced to use mobile broadband so it isn’t good to have other people eating into that limit by uploading from me. Rather than be a consumer and not give anything back I choose not to use the bittorrent clients. You will notice on the file menu that there are other options for open, including open URL and open silent URL. Opening an URL will enable you to open the bittorrent download URL direct. Opening a silent URL is useful to suppress dialog messages when using certain plugins. There are a number of plugins available for KTorrent. The most useful plugin is the scheduler which allows you to set download and upload limits. The search plugin used to be good but now requires you to download another client tool. There is also a web interface plugin which lets you control KTorrent from your browser. You can limit the download and upload speeds. If you have a limited internet connection and a number of users that share the connection, then you might want to specify a maximum download speed so that the internet is still useable by the other people in your household. 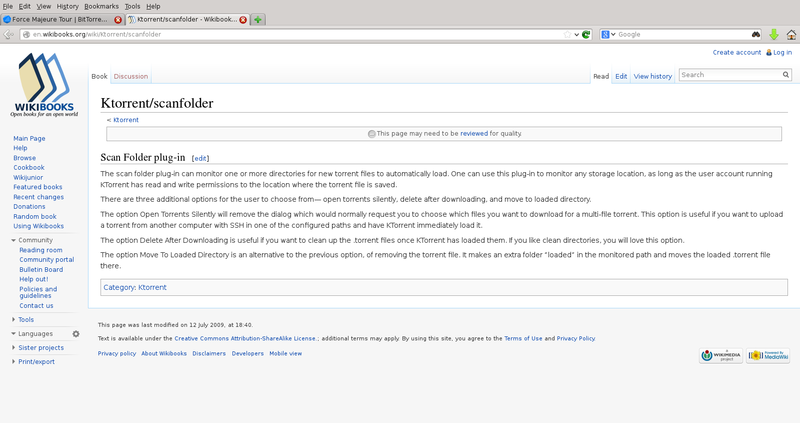 As with all KDE applications, KTorrent comes with a host of configuration options. Bittorrent clients are simple in their nature so there aren’t as many options for KTorrent as there are for say KMail. For the application itself you can specify a default save folder, a place to copy torrents to and a place for completed downloads to be copied to. The “Queue Manager” tab has a number of options surrounding the actual downloading and uploading such as setting the maximum number of file downloads that can take place at once. Bittorrent software is often portrayed in the media as a method for illegally downloading protected material but it is also used for many legally acceptable means such as downloading Linux distributions. Many distributions would prefer it if you used a bittorrent client as opposed to a direct download link as it saves the load on their own servers. As with peer to peer downloads you are really expected to give back as well as take. If you download lots of material then you in theory should let people upload from you as well. If you have a limited internet connection this might not be so easy. I enjoy reading your articles/reviews – keep up the good work !. This one on torrents is timely for me – I have been lurking at the Crunchbang forums for a while and it looks like an interesting distro. However it seems (from their download page ) that it is only available by BitTorrent which definitely puts me off. Whatever about being a "leecher" I would certainly not be comfortable being a "seeder". By the way – I like the JR Hartley reference – your showing your age ! My name ?? The KTorrent BitTorrent client is a decent one, and if you are sticking with all KDE-based client software packages, then KTorrent is just fine. This is one case, though, in which a Gtk+ client, Transmission, wins the battle – unless you are going to get extremely fancy and selective with your torrent client; otherwise Transmission is smaller, simpler, and faster. KTorrent is also good, but it's a bit bigger and more complex, though less so than may other KDE applications, which tend to offer many different options, giving you more flexibility, at a cost of being somewhat more complex; here's a case where a simple Transmission torrent client gets the job done well and very simply; just start it up until the file you want has been copied.